We love our newest fabric line, Autumn Lily, which arrived in the quilt shops last month. The color palette feels calm with a pop of sky blue. Below is Autumn Bouquet our newest quilt pattern made using the fabric line. It's an easy and quick one to make. Where do I love to spend my summer days? My vegetable garden in my backyard is one of my favorite spots. 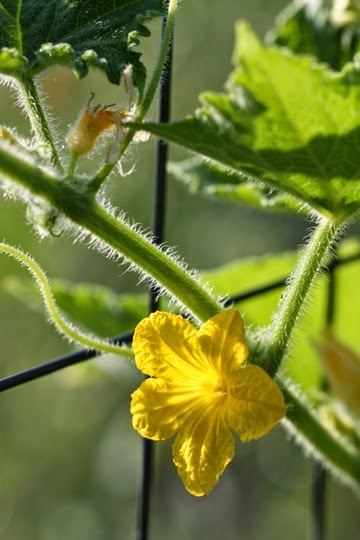 Weeding cucumbers, squash, peppers and tomatoes consumed a lot of my time this year. All of the work was worth it. Our weather was perfect and the harvest was abundant. My collections always bring a smile. This sweet tape measure is one of my favorites. Birds images capture my attention. This puppy tape measure is a close second. Isn't his face just the sweetest? I love old quilt blocks. Their faded colors and whimsical use of prints are always interesting to me. I fell in love with quilting while in nursing school. I took a quilt class, and forever after, the colors, textures and patterns of quilt blocks have been a passion. I think the best part of the design process is picking out the fabric. Putting prints and colors together always are a source of new ideas. So many fabrics and so little time. At spring quilt market, the Moda designers all made the same pattern with their fabric. Click on the link for the pattern. Barb and I didn't attend the market, but still wanted to participate in the blog hop. This design is calling my name and I think I will begin it this weekend. The quilt looks so easy and quick to make. Charm packs and layer cakes work great for this project. Click on the link to get your free pattern. Of course there is a contest too. Sept. 13 is the end of the blog hop and we are drawing two names to win some fabric. We have a Jelly Roll and a Fat quarter pack in our Autumn Lily fabric just waiting for you. Leave a comment and let us know what is your favorite Moda precut....Layer cake, Charm Pack or Mini charms. Today is the day to visit three more design groups in the Moda Love hop. Their links are below. All of the designers are giving away fabric. Hope you are a winner!!! What a gorgeous pattern, Alma!! I love basket quilts and this one is a beauty!! I also love all of Moda's precuts...but I think the Layer Cake is more versatile so it's the one that I go to! Thanks for the chance to win this gorgeous fabric! Autumn Lily is beautiful! I love the soft color. A layer cake would be my favorite precut although I am more of a yardage gas. I love your new fabric collection! My favorite would be a Layer Cake as it gives more ways to use the fabrics. Thank you for the chance! I love the layer cakes... large enough to see the beautiful colours and fabric properly! Though I love having jelly rolls and charms to add to them! And I love old buttons too! :) Have quite the stash of those myself. Another beautiful collection of fabric. Love it. A layer cake would also be my favourite precut. I agree with the other ladies and like a layer cake as there is so much you can do with the larger pieces. This is a lovely range and I was just admiring it in my local quilt shop yesterday (in Australia). Thanks for the chance to win this lovely fabrics. My favorite precuts is a layer cake. What amazing tape measures you have in your collection, the puppy is so cute. My favourite cuts are layer cakes as they are such a useful size for backing small stitching projects. I love a fresh layer cake bundle. I love the new colors - layer cake is my choice, thanks for always making amazing things. 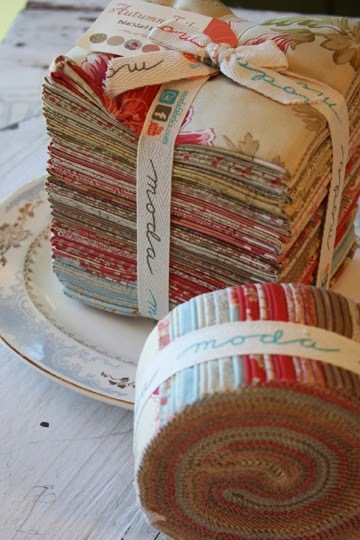 Love the Moda fabric, so fresh and sweet. Lovely new line! My favourite precut is a FQ. I love those Moda layer cakes! So much you can do with them! I love your tape measures!! Fat Quarters are still my favorite to have a 'little' of all the collection. Jelly Rolls are my favorite for binding the quilt. I love layer cakes, but my 1st choice is the fat quarter because you usually have leftovers for building your stash! Hands down I would say a stack of fat quarters is my favorite. So versatile and always a little left over. I love a bundle of fat quarters although it seems like the fabric multiplies - I can never use an entire bundle. It's a never-ending thing! Fat Quarters & Layer Cakes are my favorites. I usually use jelly rolls as a precut but layer cakes are quite useful as well. But how cute are those little mini layer cakes? I could put any of them to good use! Love your new line. Linda W.
Oh, wow! Love the new fabric and would love to win some :) I love layer cakes ~ very versatile! Beautiful new fabric!! Am spending a lot of time canning right now so I totally enjoy your love of growing and harvesting :-) My fave? I am a newbie quilter so I appreciate all pre-cuts... but layer cakes give me a lot of satisfaction. Thanks for hosting a giveaway! all the arts and designs are really superb.It was amazing blog to know the process and hand made products. I love charm packs, but I must admit I've never tried a layer cake. Thanks! love the new fabric line. You ladies are amazing ! I have yet to try a layer cake so that is next on my "gotta have" list. I usually buy jelly rolls because I do a lot of hst in my quilts. I love layer cakes--four charm packs in one! I am loving mini charms lately! They come in such a cute bundle, and are ready for quick use! I mostly buy yardage, but use charms packs occasionally. Thanks for a fun blog hop and giveaway. Charm packs are very useful! But fat quarters are my standard. Love your new pattern and fabric! I'm another one for layer cakes, but I'd certainly love to win that fat eighth bundle or jelly roll! Thanks for the opportunity - as with all your fabric lines, loving Autumn Lily! I love jelly rolls and charm packs the best, but am getting addicted to the mini charms. They are SO cute! Love the puppy measuring tape. It's so sweet! I've been using the mini charm packs recently, I just love them! They are so easy to use - just pick them, make something quick, and you're done. And the project is always so cute. I have really enjoyed working with the mini charm pack lately so I guess that's my favorite. Love the new fabric line. Your designs are always so peaceful and beautiful. I vote for layer cakes. I like layer cakes the best. They are bigger so you can do more stuff with them. Lovely fabric line. I tend to buy more fat eighth bundles then any other type....well except the candies. I love jelly rolls and fat quarter bundles, depending on what quilt pattern I have chosen. I am intrigued by the candy squares and look forward to making something with them. Love Autumn Lily, the name alone makes me think of all things vintage and wonderful. Your new line looks so cosy. I love the soft colors. For me, I think my favorite would layer cakes, as I could do more with them. Jelly rolls and fat quarter bundles are precuts I like to use. I absolutely all the Blackbird Designs fabric and books. I have lots of projects to make some day with all I have your fabric I have collected. My favorite pre-cut is a layer cake. That new quilt is beautiful, and those tape measures beyond cute. Layer cakes seem to give me the most 'mileage'. I really do enjoy all of Moda' s precuts. Just makes quilting so much more relaxing and enjoyable. Thank you for being a part of the Moda Love Blog Hop and giving all of us the chance to become a Moda winner. Your new fabric line is stunning! I'll watch for it in the stores. I like layer cake. Actually if funds were unlimited--I would love fat quarters even more! Fat Quarters are what I love most, but generally will purchase charm packs. stunning fabric collection, my favorite precut is a layer cake! Layer cakes give you lots to work with, but charm packs are such fun to get a little variety! I really like layer cakes because they give you more fabric to play with. 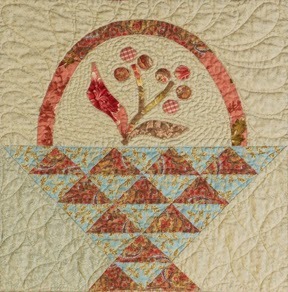 Autumn Lily is a lovely line of fabric.Your basket quilt pattern is perfect for it. I love layer cakes! Thanks for the chance to win. I love the Autumn season harvesting lots of cucs, tomatoes & peppers right now! I like charm packs because I can whip up something quickly with them. Beautiful colors in your new 'Autumn Bouquet' collection! Thanks for a chance to win! I love layer cakes and charm packs. Autumn Bouquet is beautiful!!!!! I've seen some nice patterns using layer cakes, although I have not actually bought one myself. I love the fabric line with that pop of blue! Just beautiful! Love your basket quilt and the pretty new fabrics! I don't have a favorite pre-cut - for me, it depends on the project I want to make. Charms are perfect for some, but layer cakes are good for others. Jelly rolls work good for me if I'm making jewelry. Basically, I've not met a pre-cut that I didn't like! Fat eighths is my new favorite precut. I can get a pieced block and some applique pieces out of it. I love layer cakes but find I buy more charm packs because they are so affordable. I like all of them but a layer cake always makes a nice sized throw with a lot of pattern choices. Layer cakes are my favorite precut. They're so versatile - it's so easy to cut charms or mini-charms from them, if needed. Layer cakes are my favorites. Love your new fabrics. I like the layer cake precuts. I like a basic charm pack. And I do adore this fabric. Thank you for the giveaway! 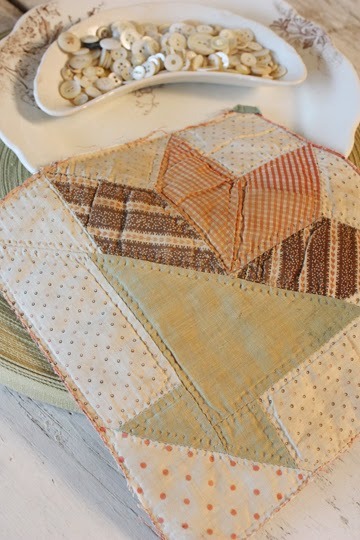 favorite precut is layer cake....pretty quilt pattern you have there! Layer cakes are great-so many things you can do with them. Love your new fabric line! I have never used a pre-cut so don't know which is my favorite. I would be so happy win any of them, I would let you choose for me! Thanks for the chance to win!! My favorite precut would have to be later cakes.With one layer cake if you need to you cand make 4 charm picks, and my mind boggles at the number if mini charm packs. Oh.. the possibilities . I love layer cakes for appliqué! Oh what a wonderful contest to enter for any sewer!!! I would have to agree with Ginny. I would pick the layer cake as my choice. It can always be cut down to size as needed. Thanks for the chance to WIN FREE FABRIC!!!! Loving the new fabric lines ladies -- such beautiful colors and prints -- and that pattern is just right. A bit of piecing and applique - Love that!! I love all pre-cuts but I work most with Charms because they are inexpensive but still give you a wide variety of fabric - they are also great little "scraps" to applique with. Thanks for the awesome giveaway and inspiration! Ooh your fabric is so pretty! Hmm- I usually go for versatility unless it's for a specific project, so I'll say layer cakes. But charms are perfect for some patterns! My favourite pre-cut is half yard bundles, so much fabric and so many choices then. If I have to pick from the 3, I would say layer cakes but I really prefer fat qtrs. or fat 1/8's. 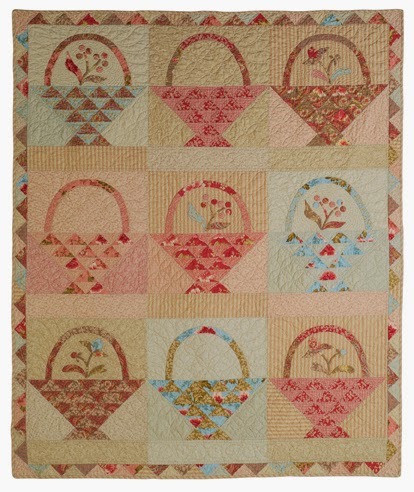 Autumn Lily is so pretty and I love the basket quilt! Thanks for a chance to win some of your beautiful fabric! My favorite is the charm packs. Ohhhh, I love old quilts, too! I have two from my grandmother that I treasure. 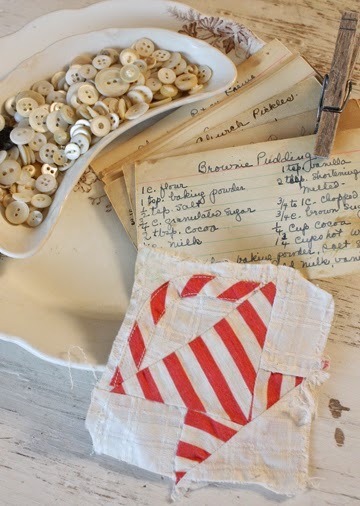 I have always loved Charm Packs, but have been thinking I need to try a layer cake because there is more fabric to work with in larger chunks....must try that! I love pearl buttons and the way you show them off! I have used jelly rolls mostly so suppose they are favorite by default. I like layer cake precuts. I like Layer Cakes- I can always cut them smaller. Thanks for the giveaway. Your little dog tape measure is adorable! My favourite pre-cuts are charm packs. My favorite is the layer cake. Love the tape measures. My favorite precut is the Moda Candies. I use them all the time. Your tape measures are adorable. I just love your fabric lines, so warm & comforting. I guess my favorite precuts are both layer cakes and jellyrolls - hard to pick one. Love your new fabric line! My favorite precut is the layer cake. My favorite precut is the FQ bundle but if I'm in pinch the smallest I'll go with is a layer cake. they are just so convenient. BTW: Love your new line! Layer cakes are so versatile. And they look so pretty, all stacked up! I love your new fabric! Of the 3 precuts you listed, my favorite would be the layer cake. My favorite precut is the layer cake. They always look to pretty to open. Your new line is so pretty! I tend to buy yardage or precuts per the recommendation on my pattern requirements. When I'm stashing, though, I usually choose layer cakes or occasionally charm squares. I love fat quarter bundles! I love your new quilt design too! Jelly rolls are my favorite way to buy a collection! Charms are great way to start too. Fat quarter bundles are terrific, but realistically, I end up with charm packs or a layer cake. Great new fabrics! I love layer cakes-need the bigger images- Great new line! Fat quarter bundles are my favorite followed by layer cakes. Thank you for the chance to win. Love layer cakes and charm packs. Both make perfect-sized quilts. My favorite Moda pre-cut is the charm pack. I can make a quick easy quilt just sewing them together. It's also a great pre-cut to use when teaching the next generation how to sew a quilt. I love layer cakes - lots of uses out of those squares! Autumn Lily is a beautiful line of fabric, thank you for the chance to win! There is so much more you can do with a Layer Cake so that is my favorite today. My favorite pre-cut is a charm pack. Love your "loves"! Layer cakes are my favorite because I get four charm packs!! Love the charm packs, and the mini charms. I love to make scrap quilts, the little charms and minis can add more variety to the scrappy projects, if I don't find my personally generated scraps are giving enough variety. I thought I loved the layer cake packs but today when browsing the blog tour sites I was given an idea for the mini charm packs. SO - after giving them a try I may have to change my allegiance to them! I love working with charm packs. I love all pre-cuts as I like to have the entire line. My favorite at the moment is layer cakes. I love your tape measures! My favourite precuts are layer cakes. There is just so much you can do with them. 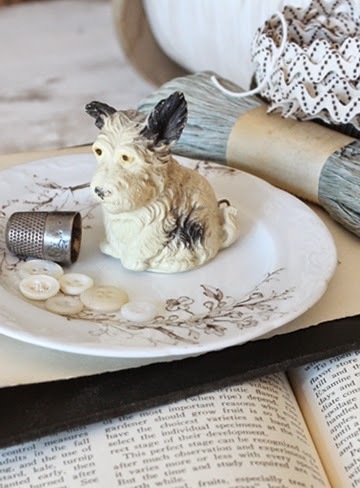 I agree - the the little Scottie dog measuring tape is adorable! Love the charm packs and how quickly I can whip up a tablerunner with them. 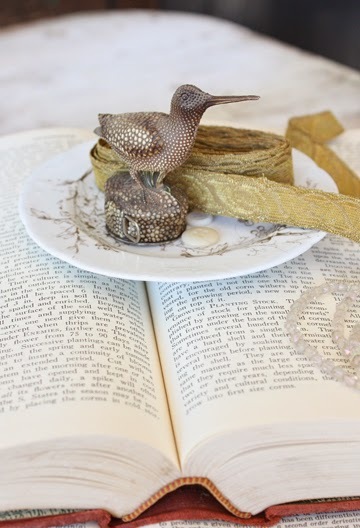 Love the tape measure bird. It is so charming. Working with your Natures Basket layer cakes today. So I better get back to it. Autumn Lilly is beautiful! My favorite precuts are layer cake.....so many possibilities! Charm packs are my favorite. I want to say all three but I know that won't fly, so I will pick layer cake. Love Autumn Bouquet and your charming collecion of old things. I like charm packs but that is because that is all I have ever used. I've only used Charm packs before, so that would be my current favorite! I love using them because they are fast ans easy to put together. Thanks for the generous giveaway! gotta be the layer cake! so versatile! There isn't a fabric of yours that I haven't loved!!! My favorite pre-cut is the jelly roll. Looking forward to seeing Autumn Lily in the quilt shops close to me. I love the prints from nature that appear in your fabric lines. My favorite pre-cut is the Layer Cake--very versatile and if needed, could yield 4 charms or 16 mini charms. Thanks for the chance to win some of Autumn Lily! I like jelly rolls and fat quarters..and I love your new fabric collection, Autumn Lily! My favorite precut...Well I love them all, but I guess a jelly roll and a fat eight bundle are really one of them LOL. Out of those 3 I would have to say the layer cake. My favorite would be charm packs. Thanks! Autumn Lily is a beautiful line, Alma. Currently my favorite precut is the layer cake. Thanks! Layer cakes are my favorite to work with. Love your fabric line! I love Layer Cakes and Autum Lily is one of my Faves ! I LOVE Layer Cakes. They are a good size to use as they are, or they can be cut into smaller sizes to add variety and interest.. They are also great for most appliqué pieces. Also, I can get a many different prints/fabrics without carrying 15 bolts of fabric to the cutting counter. I LOVE your Autumn Lily line! I like charm packs and minis. I like the charm packs and jelly rolls. Beautiful colors i your fabric lines. A layer cake is my favorite, but I love them all!! Also LOVE your new line Autumn Lily and your new pattern!! You always hit it out of the park!! Thanks!! Layer cake is my favorite, Love your patterns and fabric! And I'm not just saying that....true story. I like layer cakes best but charm packs are a close second!! Haven't seen your new fabric except on internet but looks wonderful. I like them all, no favorite. I really like this pattern. Must be something about nurses and quilting. I'm a nurse (retired) and started quilting while in school. I also have several of my great grandma's quilts...one in poor condition. My mother wishes me to re-create this one. I like the layer cakes because they are so versatile. I love all precuts. I use charms, jelly rolls and fat quarters the most. Love your colors! Charm packs are wonderful for making quick quilts. There's no cutting, just join them together with a bit of sashing and you have a quilt. Great for baby quilts. I love jelly rolls and charm packs. There are so many things you can do with them! Charm packs are my favorite. I can do the most with them. Well, of course it's always hard to pick and choose. If I could have just one I would pick layer cake. I enjoy working with layer cakes as they are so versatile. My favorites are the layer cakes...I am planning on making a rag quilt from them...thanks for the chance to win! I enjoy working with layer cakes. My favorite are the layer cakes but I love all the precuts, they are so useful (and cute) ! I love jelly rolls! Really I love all the precursor. I like layer cakes best as they seem more versatile than the others. Your Autumn Lily fabrics are so pretty! My favorite precut is a layer cake. Thanks for the chance to win. I love your tape measurers! Love layer cakes and fat quarters. Thanks for participating and for the chance to win! Love you Autumn Lily. Out of the three, layer cakes are the most practical but I just love those minis. Your blog post made me feel good! The colors and the subject matter in the photos was wonderful I love the Charm Pack because you can do so much with it! My favorite Moda precut is Layer Cake. And Autumn Lily is beautiful ! I love layer cakes, with just one I can make a nice size quilt. Wow the Autumn Lily, just so pretty! All all pre cuts! I love charm packs the best! The sky blue is beautiful in your Autumn Lily collection - it completes the look. As for precuts? I gravitate to charm packs since they are relatively inexpensive and give a sample of each fabric in a collection. They also work well for baby quilts. OHHHH que maravilla de colección , me encantan los jelly rolls, y los layer cakes. con estos dos precortados se pueden hacer maravillas...graciasss. Such gorgeous fabric!!!!!!! Love the little dog tape measure. I love all precuts! They are perfect each in their own way! I love fat quarters because they are the most versatile of the precuts. And I can make a bigger quilt. I prefer the bigger quilts, because you really can have too many lap quilts. My favorite precuts are fat quarter bundles!! Love those things! And your new line Autumn, is beautfiful! I would have to say that fat quarters are my favorite precuts, for the simple reason that you can make some of the other precuts from them as well. The Autumn Lily collection is soft and soothing and would make a beautiful quilt.